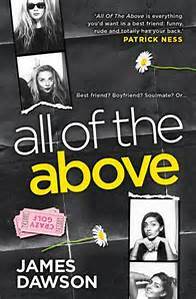 ‘All of the Above’ is one of those books that I wish I’d been able to read as a teenager as Dawson has such a distinctive voice, exploring some of the concerns you might face with candour. That said, it isn’t exactly comfortable reading. I picked this up as it’s on the nominations for Carnegie 2017, but all I could think was I’ll never get this into our school library! When Toria moves to the back of beyond she imagines hiding out until school finishes. What she gets instead is a rather unusual group of new friends, and some interesting experiences. There is a small warning on the back about strong language, but exploring sexuality and showing teenagers drinking/drug-taking means this is going to be one of those novels that will get some het up about the content rather than focusing on its relevance. There is a knowingness to this that could be off-putting, and I sensed some editorial judgements that led to a real conflict. The word ‘f***k’ was starred throughout the novel, yet other terms that might be considered more derogatory were used without concern and printed in full. I’d be interested to know the background to this decision, but I did feel it painted a somewhat skewed picture of this group of teens. Ignoring those reactions, the story itself was compelling for what it showed us about the friendships within it. Toria veers between self-obsessed drama queen and painstakingly shy – but her hesitancy and discomfort in her own skin was very real. Polly is a force to be reckoned with; not always likeable but eminently lovable. Beasley was a guy that had you rooting for him to get his happy ending. Daisy…think I’m in love! Her struggle was dealt with sympathetically, but without it all being too saccharine. Nico could have been a character to loathe, but he’s a good guy who just happens to not be the one for that moment. While there were bits I was less keen on – the whole crazy golf setting became wearing – I felt Dawson captured well that sense of self-doubt. This was a novel that bravely shows sometimes people get it wrong, and that’s okay.